Kenza is also famous in Marriage Certificate Attestation service. Everyone knows the importance of marriage certificate attestation. A marriage certificate is a valuable evidence for two people are getting married. The certificate is very useful for getting the visa for husband/wife. 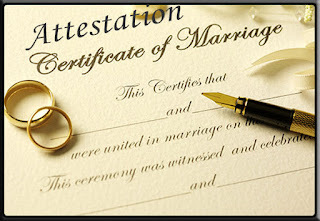 Our team will help you for marriage attestation. There are different steps to get marriage certificate attestation in qatar. So our company will help you in getting an attested certificate very quickly.